Smoothie with fresh fruits and Kefir milk , cold, fresh, yummy, full of color and so healthy! One of my favorite place to walk around in my childhood, was the flea market in my hometown with fresh vegetables and fruits. This takes place every Wednsday (still does!). The colors of the products and the aroma were simply amazing and it was a challenge for me to discover something I have not tasted so far. My main responsibility was to select the fruits and my mother was responsible for the vegetables. Years have passed and the specific flea market was extended to cloths and shoes and whatever you can desare and this actually made me not to enjoy it as I used to. So I stopped visiting the market. Until I was in Exarchia on Saturday morning for kids activities, in Kallidromiou street with the amazing flea market! Everything about fresh fruits and vegetables! And the memories came back to me…so imagine me walking around! I start walking among the little flea shops and suddenly I realized that I was carrying more than 3 bags! What i purchased? Red strawberries, cherries, apricots, bananas, fresh fava beans, spinach, tomatoes and colored pepers! To be honest, I cannot recall if there was anything else in the bags…but again we enjoyed all of them! Fresh fruits! Really, isn’t it one of the greatest gifts that Nature can offer us? Sweet, bitter, with great aromas, yummy, with amazing colors… I love them all (even thought I am not huge fan of melon)! You can enjoy them as they are or with greek yogurt or with oat or with ice cream or as a drink! So far we have tried Smoothie with Strawberries and Black berries and we adore them. But this time, I wanted to use also milk in our drink! Lately drink a lot of milk with kefir, which is really healthy! But… my princess wants it with aroma taste and my prince does not like it at all! The best way to solve this issue, is of course to hide this milk in our smoothie! The only thing we need for making the smoothie is food processor. Add all the ingredients and make them like juice. Honey and milk kefir add them according to your taste. For our drink I have used 1 tea spoon of honey and 1 small glass with milk. And the color is amazing! 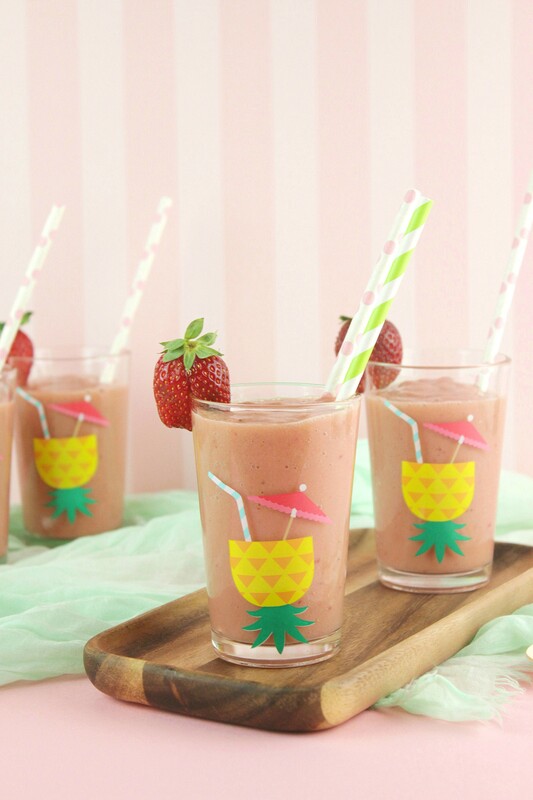 Smoothie is already served in cute glasses with Summer vibes and for decoration a few strawberries are more than enough. Kids enjoyed it so much and we prepared more to drink! The good think is that my prince did not realize at all the milk with kefir in the juice. So, what are your tricks for serving tastes or ingredients to your little ones that they avoid to east? I am obsessed with smoothies lately! I normally freeze my fruit into smoothie packs for convenience. Your recipe sounds so good! I’ve never heard of Kefir milk! This smoothie recipe sounds so yummy I’ll have to try it! I hate carrots. When I was younger they were giving out samples of “carrot ice cream” to advertise a vita mix blender. I fell in love with it, even though it was basically blended carrots with water ice and sugar. I hate carrots. The only way I would eat them when I was little is in a smoothie. I even convinced my mom to buy a vita mix, because that is what made the carrot smoothie the first time I tried it. 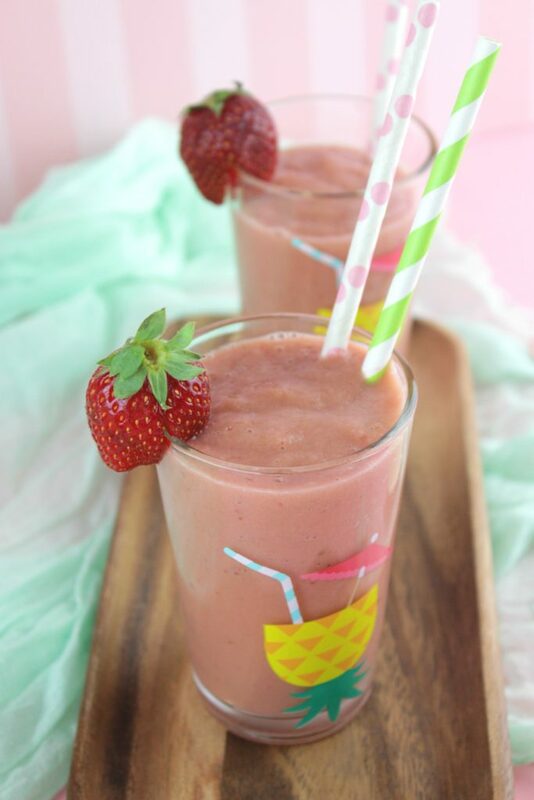 Love a good smoothie in the summer! Can’t wait to try this one wit kefir! This is one healthy smoothie and perfect for summer. I like the combination of the fruits and the milk with Kefir. Can’t wait to try this on weekend. The smoothie looks delicious. We’ve been substituting our milk with hemp milk. 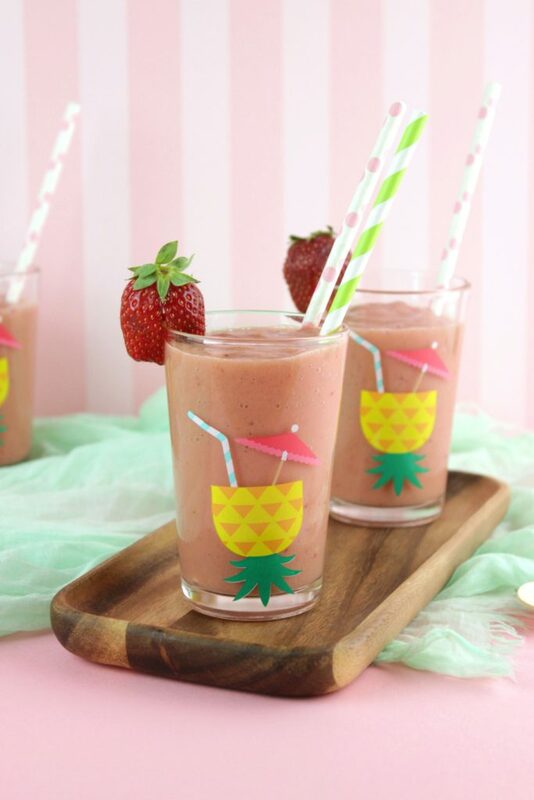 I’ll have to share this recipe with my daughter because she makes the smoothies in our home. We’ve been substituting real milk with hemp milk lately and so far so good. This smoothie you have pictured looks delicious.. I will share the recipe with our daughter who makes the smoothies in our home. Childhood memories are always so lovely to remind and also to read of someone else as yours. I love fresh fruit juices but I’ve tried the one you’re sharing here but it looks so yummy. Actually, “kefir” is the term I came across for the first time. Its getting so warm over here, so bring me all the smoothies please. I have never put Kefir in my smoothies, should give that a try. This looks beautiful and so refreshing! Colorado is seeing a heat wave, so I’ll need it. Thank you! How delicious! My kids share my love for smoothies, especially smoothies with a fruity taste. They’d certainly enjoy this one. I have recently started drinking Kefir and never thought about using it in a smoothie. This one sure does look delicious. I really enjoy a smoothie, especially on days like today when it’s so warm! Kefir milk is a lovely idea and one I would love to try out.